Sterling Silver Open Triangular Jump Rings measure approximately 5x5mm. 22 Gauge (.025). 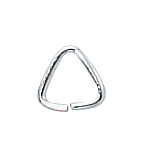 These triangle shaped jump rings also can be used as bails! Sold in packs of 50.